Key to making personalized medicine a reality, companion diagnostics are playing a critical role in the accurate diagnosis of disease and are enabling the efficient use of targeted therapies. This highly complex sector continues to innovate, as exemplified by the development of liquid biopsy technology, which introduces a new, noninvasive, cost-effective way for clinicians to make treatment adjustments. “As genomic research identifies new disease states and patient subpopulations, the pharma industry and clinicians must be able to respond with specific targeted medicines. Companion diagnostics are changing the way that powerful new targeted medicines are used to the benefit of patients, physicians, and health payers,” said Robert G. Hunter, Senior Editor, Healthcare, at BCC Research. There has been substantial progress in personalized medicine thus far, for example, the rapid increase in the number of targeted therapies. However, this experience has also revealed significant barriers to widespread adoption by physicians. Advances in molecular medicine and real-time biometrics require healthcare providers to aggregate, evaluate, and synthesize hundreds to thousands of relevant facts to arrive at a single patient decision. Furthermore, dramatic changes in the regulatory and technology landscapes, as well as economic misincentives between drug and diagnostic developers, are hindering progress under the existing industry configurations. Reimbursement continues to be a major challenge for diagnostics. These pressures, along with increasing requirements for whole-genome sequencing, proteomics, and big data solutions, are leading to the emergence of new and potentially disruptive offerings often termed “universal companion diagnostics.” These are performed as laboratory developed tests and are increasingly contracted with insurance companies directly. BCC Research’s analysis of the new universal companion diagnostic business model concludes that there are essentially two components: decision support tools and laboratory developed tests. Overall, the global market for companion diagnostics was estimated to be worth $4.3 billion in 2016. Driven by the growth in targeted therapies coming to market and the wider use of companion diagnostics in multiple therapeutic areas, the market is expected to reach nearly $17.6 billion by the end of 2021 at a five-year compound annual growth rate (CAGR) of 32.3%. By category, five-year CAGRs are as follows: FDA cleared/approved (cancer), 25.1%; FDA cleared/approved (noncancer), 17.1%; laboratory developed tests, 24.4%; decision support tools, 59%; and detection (liquid biopsy and next-generation sequencing), 110.0%. A liquid biopsy looks for cancer cells that are circulating in the blood or for pieces of DNA from tumor cells that are in the blood. A liquid biopsy may be used to help find cancer at an early stage. The proteins that are measured in blood today may not provide enough information to make an informed treatment decision. At the annual meeting of the American Association for Cancer Research (April 1–5, 2017), there were at least 130 presentations, poster sessions, and panels on liquid biopsy studies. Research groups revealed their progress in efforts to detect, amplify, decode, and (most importantly) identify meaningful information from circulating tumor cells (CTCs) in the blood, other circulating fragments of DNA (cfDNA) and circulating tumor DNA (ctDNA) that are outside the confines of cells, exosomes, and microRNA. A new blood test that can detect if a cancer drug has stopped working, months earlier than standard invasive biopsies, will soon be offered to patients in Australia, according to recent news reports. Tests involving more than 500 patients have confirmed the validity of using ctDNA shed by a cancer into the bloodstream as a measure of disease progression. This liquid biopsy will give patients regular reassurance about how their treatment is working, as well as allow them to stop ineffective and expensive therapies earlier, i.e., when they are likely to still have other therapeutic options. The Peter MacCallum Cancer Centre is setting up an Australian-first service to offer ctDNA tests nationally. It may replace the need for painful and labor-intensive bone marrow or tissue biopsies, while giving a more accurate snapshot of the cancer as it evolves. The new service is the culmination of 10 years of work by Associate Professor Sarah-Jane Dawson, who in collaboration with Professor Mark Dawson is now demonstrating the role of ctDNA in blood cancer. BCC Research comprehensively analyzed development of the companion diagnostics market and its prospects. 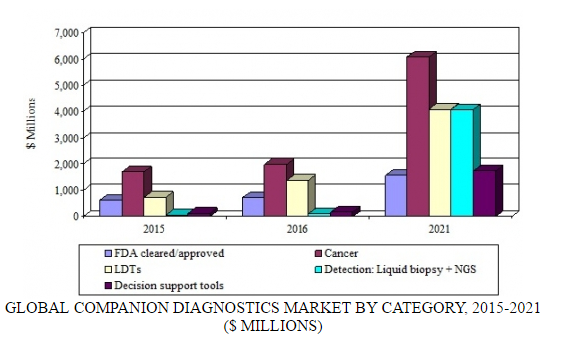 BCC Research’s study, Companion Diagnostics: Technologies and Markets, examines current and future market values, the market environment, technical innovations, and companies that are shaping this critical sector.